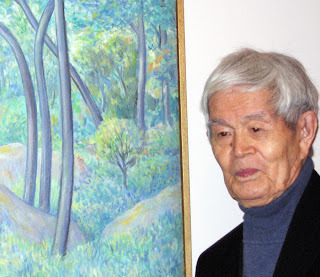 Frank Taira, who began his career as an artist almost 70 years ago, has donated an oil painting, Landscape, to the Ackerman Institute for the Family. Mr. Taira (above), who lives in an assisted living facility on the upper East Side, came to the Institute on December 14 to view his work, which hangs in the Ackerman Institute waiting room. Frank Taira was born in San Francisco in 1913. He studied art at the California School of Fine Arts from 1935 to 1938 and by the following year, he was showing his work at a juried show at the San Francisco Museum of Art and the Oakland Art Gallery. He was invited to prepare a one-man show at the Museum of Art (now the San Francisco Museum of Modern Art) when his promising career was interrupted by the outbreak of World War II. Although Mr. Taira was born in the United States, he, along with thousands of other Japanese-Americans living on the West Coast, was interned in a camp for most of World War II. Mr. Taira was sent to Topaz, Utah from 1942 to 1944. Upon his release, Mr. Taira moved to New York, where he continued his career as an artist. He studied at Columbia University, the Art Students League and the New School for Social Research. Through the years, his paintings have been exhibited at the Hudson Guild Gallery, the National Arts Club, the National Academy of Design, the Salmagundi Club and at the First International Biennale in 1998 and the Florence (Italy) Biennale Internazionale Bell’Arte Contemporanea in 2001. Mr. Taira has won several Grand Prizes for jewelry design at the Washington Square Outdoor Exhibition, has had several one-man shows at galleries, and is cited in a number of art books. His work appears in the collection of the Japanese-American National Museum in Los Angeles. In 1950, Mr. Taira contracted tuberculosis and spent time in a hospital isolation ward where he drew a series of pen-and-ink sketches. This work is scheduled to be featured at a show at the Healthcare Chaplaincy in New York in April 2008. Mr. Taira has worked in a variety of mediums and in many styles. His work, in many ways, reflects both the experiences of his own long life and those of the world of art in the 20th century. When asked about the artists he most admires, however, he said he especially loved old masters, particularly Rembrandt.